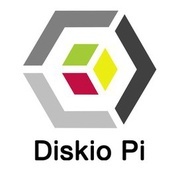 The Diskio Pi machine is available on pre sale ! We hope that this hybrid machine, compatible with lot of SBCs, will become reality ! For this last news, we are moving up a gear. We promised you a collection of photos of the prototype, it's finally here! It's fully functional, and despite some defects that will be corrected, we hope it meets your expectations. See you soon for the new chapter ! 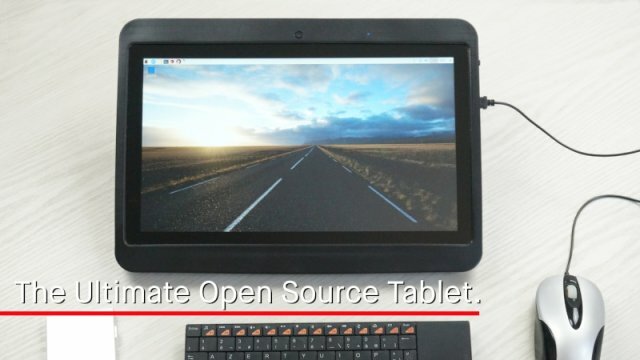 In a few weeks, the tablet will be presented in pre-sale on an American funding site (Kickstarter, not to mention it). Many things have been accomplished, the most enjoyable I must admit, and there is still a lot to do. For example, the financial part is moving forward. We try to reduce as much as possible the amount of the 100%, so that the project is promote as quickly as possible, and that it is seen by the greatest number. That's why I'm going to present the project to a banking institution. And good news, the datas are good ! Here is a new picture of the parts of the tablet (click to enlarge). 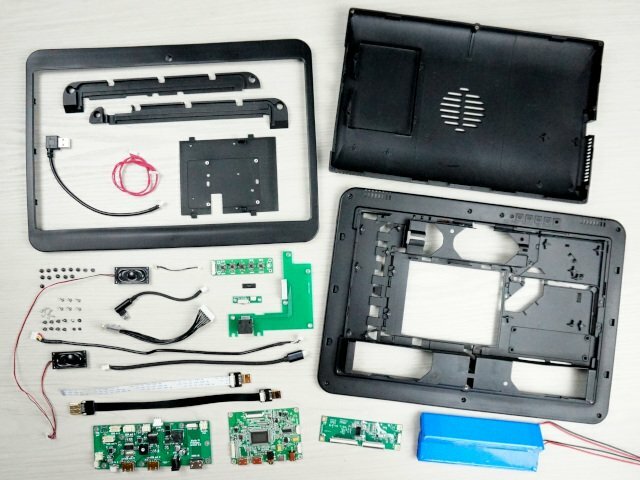 Are shown here all the parts of the basic kit, except the screen and the touch glass. The final parts will not be exactly these, but will look a lot like this. Note also that the batteries will be optional. Warning: assembly will be very precise, so I recommend that it be done by an adult, or by a child over 12 years accompanied by an adult. Depending on the budget, we will plan to deliver one or two screwdrivers in the kit, because the assembly contains very small screws. Other items, such as a special double-sided adhesive screen, will also be delivered. A complete assembly instructions will explain you step by step all the steps of the assembly. The prototype is finished ! Here is a news that will delight some of you! The manufacture of the prototype is coming to end, and today we disclose a detailed photo of the interior of the prototype, with the final boards (click on the pic to enlarge). Some cables will need to be optimized using angled plugs, but everything works as expected. The features presented here will be included in the basic version, except the battery packs and the fan. We are focusing on offer OS distributions which will work without any configuration: LibreELEC with Kodi 17 already works, an image file is ready. Soon, more photos will follow. Benjamin and I wish you a nice end of summer! After many days of preparation, we inform you that your physical rewards have been sent this saturday june, 16. Thanks to all our contributors who trusted us, the project can continue with your help. Already, the prototype of the case, and a pre-prototype board are being tested. See you soon for the continuation ! Reserved access to the "Very Early Bird" offer of the next crowdfunding (mass production): 16% off discount on the total amount of the purchase.